Ordinarily, I would not get up at 3am following a 15-hour day…it wouldn’t even be a consideration. However, we all know this was no ordinary day! Kate finally got her prince and we FINALLY got to see the dress! Kate’s style is simple, elegant and charming all wrapped together in a neatly tied bow. She is a stunning, natural beauty and surely she would have pulled off any dress that she chose. That said, I couldn’t have been happier with her choice of Sarah Burton for Alexander McQueen, as her designer. Not only is it a very British nod as the design house is from England, but the dress construction was exquisite, a characteristic the late designer was known for…and one that is fit for a princess! 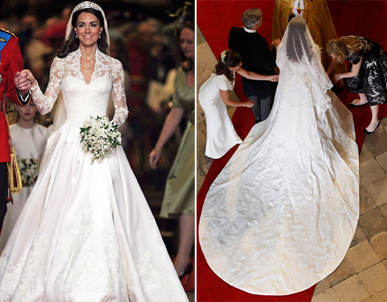 The dress itself was made of ivory and white satin gazar, with a full skirt and an 8-foot train. The fabric narrowed tightly at the waist and the hips of the skirt were padded for a bit of width, a subtle nod to McQueen’s traditional Victorian influences. It also gave the illusion of a strapless gown with a sweetheart neckline as well as a semi-plunging neckline because of the lace bodice covering her décolletage and arms. Speaking of the mixture of British and French Chantilly lace, did I mention it was hand-made, hand-cut and hand-sewn?! Typical McQueen workmanship! She had me from the moment she stepped from her Rolls-Royce. But oh, that was just the beginning! I finally got a glimpse of the gowns’ backside and it was equally as lovely. Starting at the nape of her neck, 58 gazar and organza buttons elegantly drifted toward her waist. The skirt itself began in resembling arches of fabric, tastefully transforming into elegant pleats as the train was extended. The same lace appliques used on the bodice were carried through the remainder of the skirt for added drama. Now, every girl needs something borrowed when she is getting married. And in this case, borrowed is spelled C-A-R-T-I-E-R! 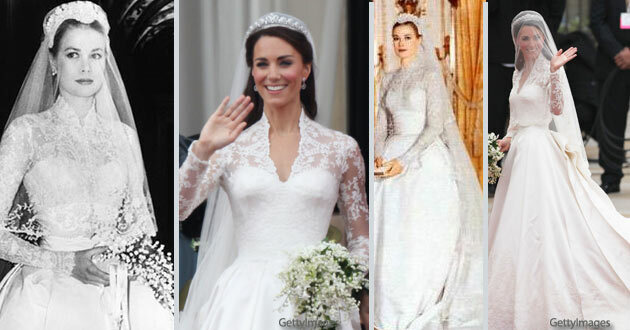 Kate chose the Cartier “halo” tiara to hold her ivory silk tulle veil in place. This veil was trimmed with hand-embroidered flowers, as were the newly-minted Duchesses’ shoes which were hand-made by the McQueen design team. In true Kate fashion, she was a timeless beauty today. She left out nothing and spared no expense, to which the bridal couture community will be eternally grateful!